Chances are, if you’re into nature or paddling, you’ve probably heard of the Allegheny River. It’s thought to be one of the best places in the country to go paddling, so if you’re looking for a chance to escape into the wilderness why not give it shot? Running through miles of wild and picturesque landscapes, the Allegheny River can be a fantastic place to spend a couple of days, or even longer, exploring this great part of Pennsylvania (and a little bit of New York). Allegheny River...What’s The Big Deal? Just under 87 miles of the Allegheny River is classed as a National Wild and Scenic River, but there are over 100 miles of dedicated water trails and over 300 miles of river, which can give you plenty of water to explore. Whether you’re after a day’s paddling trip or you’re looking for more of a multi-day paddling adventure, the Allegheny River could be perfect for a range of kayaking or canoeing trips. The river is also classed as recreational because of its ease of access and the fact that there are not many hazards. This means it can be an ideal river for a family canoe trip and a good spot for less experienced paddlers. For several miles, the Allegheny River flows through the Allegheny National Forest, which is home to hundreds of species of mammals and other wildlife, so it can be a good idea to remember to pack your camera or a pair of binoculars. You might also want to keep your eyes peeled for bald eagles, which are known to inhabit the area. As well as offering scenic paddling, the river can also be a good spot for fishing, with several species of fish to be found, including catfish, walleye, muskie and rainbow trout. 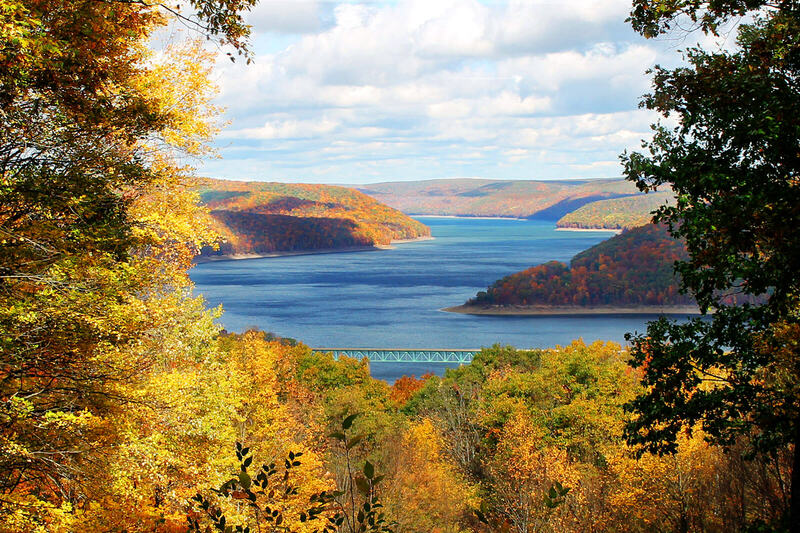 Because of the Kinzua Dam at the Allegheny Reservoir, the river manages to maintain a constant flow, which makes it navigable by kayak or canoe pretty much all year round. However, the summer can be better suited for family paddling trips because of the flow of the river. It’s advisable not to take your canoe or kayak on the river if it’s flooded or if the water flow is faster than 5,000 CFS. Can I Rent A Kayak/Canoe? 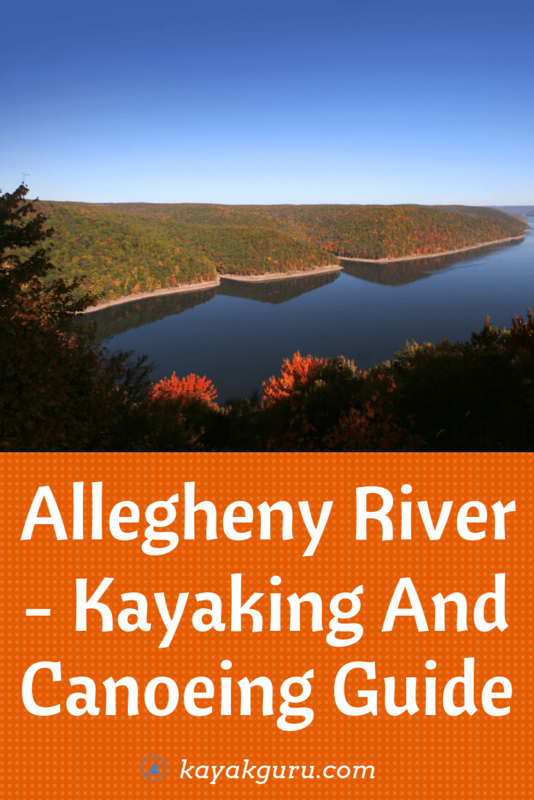 There are several kayak and canoe outfitters at various locations along the Allegheny River. There are a couple of places in the town of Warren, PA, not far from the Kinzua Dam, where you can rent a canoe or kayak and paddle along the Middle Allegheny Water Trail which runs 107 miles from the dam to the town of Emlenton, PA. If you have your own craft, there are plenty of places where you can put in and take out, including in Point Park, Warren and at the Buckaloons Recreation Area, which also has a campground with restrooms. It’s also possible to launch from the Visitor Center at the Kinzua Dam. Because of the nature of the river and the many miles of paddling opportunities, it can be a good idea to spend a few days on the water. There are lots of places you can stop for a rest or set up camp along the way, with the National Forest lands and many of the small islands being accessible for overnight camping, as long as you take all your trash home with you. However, camping is not allowed on areas marked as private land or on any State Game Lands. The Allegheny River can be ideal for both kayaking and canoeing. And because the water is mostly flat, it can also be a great place for beginners or children to take to the water for the first time. There are several trips you can do, whether you’re in a kayak or canoe. You can take on a two week adventure from Warren to Neville Island, just outside Pittsburgh, or spend just a couple of nights enjoying sections of the river and the serenity of the surroundings. Shorter trips include from Kindzua Dam to Tidioute, PA, where you will be on the edge of the Allegheny National Forest for most of the trip. It’s usually always possible to extend your trip if you fancy a couple more days in the wilderness, as long as you make sure you have plenty of supplies with you. If you’re navigating your way down to Oil City, PA, it can be a good idea to avoid the rapids there, particularly if you’re in a canoe and are not experienced. These are Class II rapids, but you may want to portage around them. They’re located where Oil Creek runs into the Allegheny River, just past Veterans Memorial Bridge in Oil City. The Allegheny River can be the ideal paddling destination. It has opportunities for day trips, weekend trips or even several days on the water. As well as its range of trip lengths, the river also offers good access, plenty of places to camp overnight and that’s not to mention the fantastic scenery, great fishing and abundance of wildlife. Remember to take plenty of supplies with you, because you may end up wanting to make your trip a little longer than you planned. Let us know how your paddling trip goes and if you have any Allegheny River tips, tell us about them. Don’t forget to share this with your fellow adventurers!